NASA’s Mars InSight Lander captured a rumbling wind sound. 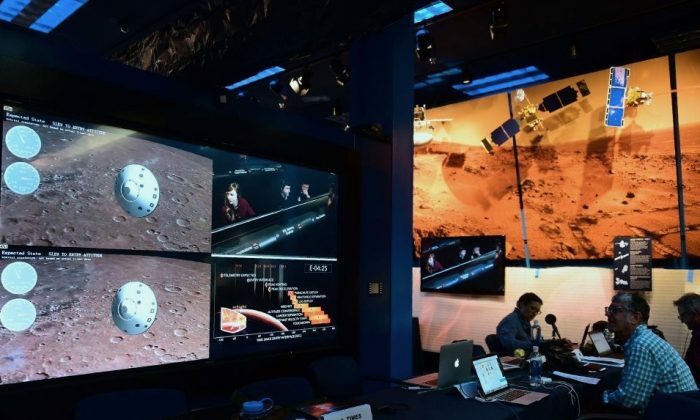 The lander reached the surface of Mars on Nov. 26, after leaving Earth 6 months earlier, Fox News reported. The wind was recorded on Dec. 1, blowing from the northwest to the southeast, which matches the “dust devil streaks” NASA observed from orbit, according to a press release from NASA’s Jet Propulsion Laboratory. The space agency said the wind was blowing between 10 and 15 mph at the time of the recording. The audio vibrations were captured by an air pressure sensor and seismometer built into the InSight Lander. The air pressure sensor is located inside the lander as part of its Auxiliary Payload Sensor Subsystem. It is designed to record meteorological data on Mars. It recorded the wind vibrations directly. The seismometer recorded vibrations from the lander by picking them up as the wind passed over the lander’s solar panels, which are each 7 feet across. To be audible for the average person without specialized audio equipment, the sound from the air pressure sensor was sped up by a factor of 100 in footage released by NASA. The seismometer’s recording was pitched upward by two octaves. The seismometer will not remain on the spacecraft’s body. The lander’s robotic arm will place it on the surface of Mars and cover it with a protective domed shield in a few weeks. The vibrational data that the seismometer picked up will now be used to cancel out the sound of the lander once the seismometer is placed on the surface. This will allow the seismometer to better detect marsquakes. Scientists hope this data will provide insight into the internal structure of Mars. A rover preparing for a 2020 launch to Mars will have even greater audio capturing capabilities. It will come equipped with two microphones. One is expected to capture the sound of a Mars landing for the first time, and the other will detect the sound of the rover’s laser. That rover is expected to reach Mars by Feb. 18, 2021. NASA is ultimately planning to send humans to Mars by the 2030s. Former Gemini 12 and Apollo 11 astronaut Buzz Aldrin told Fox he thinks 2040 is more realistic, since he believes by then astronauts might reach Mars’s moon Phobos, which will better prepare NASA for a manned Mars landing.